By Jake Rocheleau in Coding. Updated on February 21, 2019 . Your web browser of choice is truly the gateway into accessing the global Internet. The web has been growing exponentially, and we have seen tremendous changes to browsing software as well. Mozilla has been keeping up well considering the recent release of Firefox 10 which has seen mostly positive review. But as we all know, your web browser tends to slow down over time with repeated use. Firefox is not immune to this, but there are some tweaks you can use to optimize the browsing experience. The key values we’re looking for include startup speed, reduced load times, and accessible web pages. Check out some of my tips in the guide below if you’re looking to enhance the Firefox experience! A good place to start is with a few handy keyboard shortcuts. These can be difficult to memorize at first, but over repeated use you’ll begin to adopt the routine. And I feel there’s no better way to speed up your web browsing experience than mastering a few shortcut keys. Only a couple examples may seem relevant to your needs. We don’t all require the same knowledge and so one command may be totally pointless to somebody else. If you check through Google you’ll likely find very helpful articles for the more common shortcuts. Security is of the utmost importance to consider whenever you’re surfing the web. Even by today’s standards things are a lot less risky than 5 or 10 years ago. But you should understand how private browsing data is stored and what you can do to clear your info. This short menu which pops up is a condensed version of the settings panel. 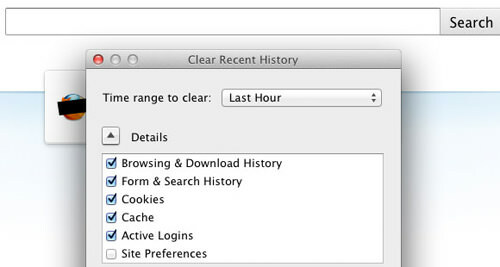 You can choose how far back in time to clear out along with specific types of data such as cookies, cached pages, active login sessions, etc. I recommend that you clear everything within the list every time you close down the browser window. This is only my personal preference to keep my data secure – but of course you should adopt some form of routine cleanup which works best for you. The Firefox add-ons menu is a small toolbar which appears at the bottom of your Firefox window. From here you can access add-on commands and menus which are normally reserved from within the regular plug-ins area. This may be one of the lesser-known shortcuts but does come in handy frequently. If you like to keep your browser slim with reduced add-ons then this may pose as a bit uninteresting. And I have to agree that fewer 3rd-party extensions means much quicker browser performance. Just keep this in mind as you’re testing out new add-ons from time to time. There have been numerous instances using Firefox where I’ve been downloading files and accidentally clicked out of the downloads window. It’s a harmless gesture, though it can be a pain to find your menu again. This command brings up not just your active downloads but also recent history of previous files – very handy when you forget which folder you saved into! Note: For Mac users, replace Ctrl with Command. When Firefox saves a cached version of website content it reduces any future requests needed for re-downloading code. By default you can only max out to 1GB of saved cache from the web. But this is likely such a small amount compared to your overall disk space, it’s well worth the effort to update your cache sizes. I recall Firefox 8.0 had local cache storage at 256MB by default. Honestly this is a fair amount of room, especially if you’re clearing out private data at the end of each session. Yet if you browse for hours at a time each repeat website visit will accumulate possibly 10-15 minutes of saved load screens. In the top menu open Tools -> Options or Firefox -> Preferences... on Mac and click on the Advanced Tab. Somewhere in the middle of this menu you’ll see “Limit cache to” along with a number input. I’ve chosen 1024MB which happens to be the maximum allowed. Simply hit OK and restart the browser for this to take effect. It’s a good idea to keep wary of installing too many extensions into Firefox. The browser will begin to lag fairly quickly if you neglect to disable unused add-ons, but luckily it’s also an easy process to remove them. Below are a couple of the most popular user-voted add-ons which won’t interfere with your speed or page performance. In particular this is a very helpful addon I’ve come to love since first installing. The download statusbar is not obtrusive or even displayed in any way until you download a file. Instead of having a new window appear you get a neat toolbar at the very bottom of your browser window. From this you can check the total file size and amount remaining, along with an estimate of time remaining for the download to complete. You can single-click on a file to pause and even remove items from the queue. My process of downloading files has become more streamlined than ever now that I’m not dealing with a new window for my items list. If you haven’t tried this out yet I highly recommend giving it a shot! The funky plug-in with a weird name actually has taken me by surprise! As the title says: WOT – Know Which Websites to Trust provides a rating for every website you visit. These are backed by users of the software who have given rankings to sites all over the Internet. Many users feel this has little-to-no purpose since you can gauge the legitimacy of a website within the first few seconds of landing. Definitely true, but I do frequently cycle through random websites found in social network communities like StumbleUpon. In this scenario I feel WOT hasn’t provided any first step security, but it does help me build credibility and trust for domains I run into through differing sources. Most Firefox users are familiar with Adblock Plus which has proven time and again as a sure-fire ads remover. From this core a developer Wladimir Palant from ABP released an extension called Element Hiding Helper. Now you can target any specific page element and choose to block it regardless of the internal content. This feature has become standard to users of the Opera browser and more recently has been picked up by Google Chrome. Yet the speed dial home page setup was never implemented into Firefox in any majorly functional way. This plug-in gives you total control over which links appear wherein the 9-box grid system. You have easy access to manipulate settings as well, such as default thumbnail height/width and a few keyboard shortcuts. Overall the software has a lot of support from the Mozilla user base. If you want to learn more check out the official website for detailed features and release notes. Firefox users have the ability to edit internal variables within the software from the configuration area. Simply open a new tab, type about:config and hit enter. 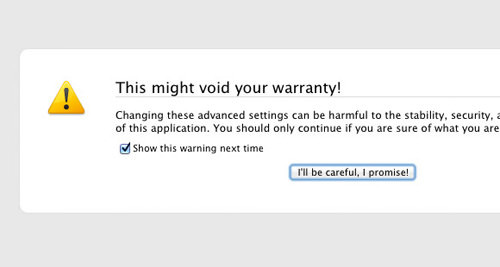 You’ll come to a warning page mentioning the dangers of blindly changing these settings. But we know what we’re doing, so just hit “I’ll be careful” and you’ll be directed to sorted table of values. Each of the values in the far left column are associated with a type of variable name. These control instances of how the software runs and performs in the background. I have just a few suggestions for reliable edits. In the filter box at the top type in network.http.pipelining.maxrequests. This should limit your field to a single value row set at 4. We can increase this number to 8, which means Firefox can request data through 8 different channels rather than 4 – greatly decreasing your waiting time! Once you edit this value above you’ll need to enable pipelining to see any major effects. Do a search for network.http.pipelining and the first value should be set to false by default. You want to change this to true by double-clicking on the table row. Sometimes when Firefox realizes a page is going to take a while to download it will apply placeholder images. This is to prevent page content from rendering improperly while waiting for the image data. It seems like a good idea in concept, and it does have value but I feel disabling this feature will keep the requested content organized. In the filter box do a search for browser.display.show_image_placeholders which should be set as true. Double-click to change this to false and we should be all set. While we’re removing unnecessary features let’s turn our attention to the browser UI. By default Firefox uses a small animation effect whenever you open or switch onto a new tab. It seems small at a glance but once you disable this you’ll be shocked at how much quicker you can move and create tabs. Just do a search for browser.tabs.animate and change the value to false. This variable is similar to pipelining except now we’re looking to open more connections on the server end. This is set much lower at first to keep Firefox downloading at a steady pace. But if you are downloading larger content such as streaming audio or video more persistent connections will mean more data collected at once. In the filter box enter network.http.max-persistent-connections-per-server and you should find only one result. By default the value should be 6, but double-click and change to 8. Then hit okay and restart your browser for these effects to kick in! With so many options in today’s browser market Firefox appears to be holding a steady pace. Their engineers know how to build stable software as it has been a reliable brand for years. With the endless number of plugins and extensions free to download there are solutions for practically any problem. I hope these tips can provide a solid foundation for optimizing your web browsing experience. If you have any other great ideas for speeding up Firefox please let us know in the discussion area.